Quartz is an old German word that originally meant something like hard or tough. It is the most common mineral in the continental crust, and the one with the simplest chemical formula: silicon dioxide or SiO2. Quartz is so common in crustal rocks that it's more notable when quartz is missing than when it's present. It breaks into curved shards rather than flat-faced cleavage fragments, meaning it exhibits conchoidal fracture. If found in crystals, quartz always has a hexagonal cross-section like that of a common pencil. 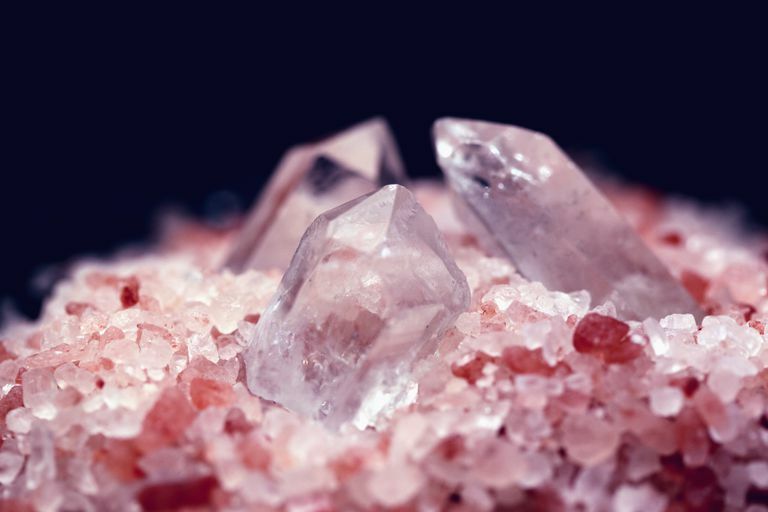 Most examples of quartz are clear, frosted, or found as milky-white grains of small size that don't display crystal faces. Clear quartz may appear dark if it's in a rock with a lot of dark minerals. Clear, colorless quartz is called rock crystal. Translucent white quartz is called milky quartz. Milky pink quartz is called rose quartz. Its color is thought to be due to various impurities (titanium, iron, manganese) or microscopic inclusions of other minerals. Purple quartz is called amethyst. Its color is due to "holes" of missing electrons in the crystal in combination with iron impurities. Yellow quartz is called citrine. Its color is due to iron impurities. Green quartz is called praseolite. Iron impurities account for its color, too. Gray quartz is called smoky quartz. Its color is due to "holes" of missing electrons in combination with aluminum impurities. Brown smoky quartz is called cairngorm and black smoky quartz is called morion. The Herkimer diamond is a form of natural quartz crystal with two pointed ends. Quartz also occurs in a microcrystalline form called chalcedony. Together, both minerals are also referred to as silica. Quartz is perhaps the most common mineral on our planet. In fact, one test of a meteorite (if you think you've found one) is to be sure it doesn't have any quartz. Quartz is found in most geologic settings, but it most typically forms sedimentary rocks like sandstone. This is no surprise when you consider that nearly all the sand on Earth is made almost exclusively from grains of quartz. Under mild heat and pressure conditions, geodes can form in sedimentary rocks that are lined with crusts of quartz crystals deposited from underground fluids. In igneous rocks, quartz is the defining mineral of granite. When granitic rocks crystallize deep underground, quartz is generally the last mineral to form and usually has no room to form crystals. But in pegmatites quartz can sometimes form very large crystals, as long as a meter. Crystals also occur in veins associated with hydrothermal (super-heated water) activity in the shallow crust. In metamorphic rocks such as gneiss, quartz becomes concentrated in bands and veins. In this setting, its grains do not take their typical crystal form. Sandstone, too, turns into a massive quartz rock called quartzite. Among the common minerals, quartz is the toughest and most inert. It makes up the backbone of good soil, providing mechanical strength and holding open pore space between its grains. Its superior hardness and resistance to dissolution are what make sandstone and granite endure. Thus you could say that quartz holds up the mountains. Prospectors are always alert to veins of quartz because these are signs of hydrothermal activity and the possibility of ore deposits. To the geologist, the amount of silica in a rock is a basic and important bit of geochemical knowledge. Quartz is a ready sign of high silica, for example in a rhyolite lava. Quartz is hard, stable, and low in density. When found in abundance, quartz always points to a continental rock because the tectonic processes that have built the Earth's continents favor quartz. As it moves through the tectonic cycle of erosion, deposition, subduction, and magmatism, quartz lingers in the uppermost crust and always comes out on top. Are Plutonic Rocks From Pluto?